I love to talk about my favorite products, college, and health, but I also like to keep it real and talk about things that might not be as "popular" or "pretty." Welcome to the Let's Talk About... series. These posts will be about issues that we deal with as women, millennials, twenty-somethings, human beings. Unfiltered. Just like this photo. Life is quite a rollercoaster. There are highs and lows. There are parts of life that don't make sense and make us question everything. There are other parts of life that are so incredible, we can't put it into words. I just want to be authentic with you all. I know how overused that word is right now, but it's true. Life isn't always pretty, but it isn't always ugly either. We'll be talking about it all here, especially on these Let's Talk About... posts. Today, I'm going to share with you all something that I deal with. This is well, a not-so-great part of my life, but I'm talking about it. I don't remember the exact moment that I realized that maybe what I was feeling wasn't normal. I do remember it was the summer of 2015, though. During that summer, so much was happening and I was feeling more stressed than usual. I've always been a worrier and overly stressed, but it was different this time. It was during this time that I realized that maybe it wasn't "just some stress." I was emotionally exhausted. I wanted to sleep more, but couldn't sleep. It felt like there was an elephant on my chest. I wasn't hungry. Little things would go wrong and it would set me off. I heard that all the time. I still hear it, in fact. There have been a few things recently that have really set off my anxiety. Finances is one of those things. I had an anxiety attack every single day last week. I struggled to get out of bed every morning, even though I love my job. I went to work and put on a smile, but my chest felt tight all day long. I was on the verge of tears. I cried in the shower. I just wanted to sleep. Not so pretty part of life, huh? Anxiety makes small bumps in the road feel like mountains and mountains feel impossible. As someone who believes in God, anxiety interferes with my trust in God more often than I would like to admit. Anxiety makes me fearful. I am afraid of failure, but anxiety heightens that fear. Honestly, it has played a role in my lack of YouTube consistency and that despite wanting to start a podcast for the past year, I still haven't done it. If you battle anxiety or are struggling in life right now, I'm here to say you aren't alone. If you feel alone and need someone to talk to, I'm a great listener. DM me on Twitter or Instagram or stay anonymous on Tumblr. A couple things that I do that help me with my anxiety are yoga, a quick workout, eating healthy, essential oils (lavender is great! ), talking about how I'm feeling, and taking a minute to be still. Also, I've learned what triggers my anxiety and sets me off. I know that working out and using essential oils is not what helps everyone. If you need medical, professional help, seek it. Medication is totally needed sometimes and that is okay. Don't be ashamed. 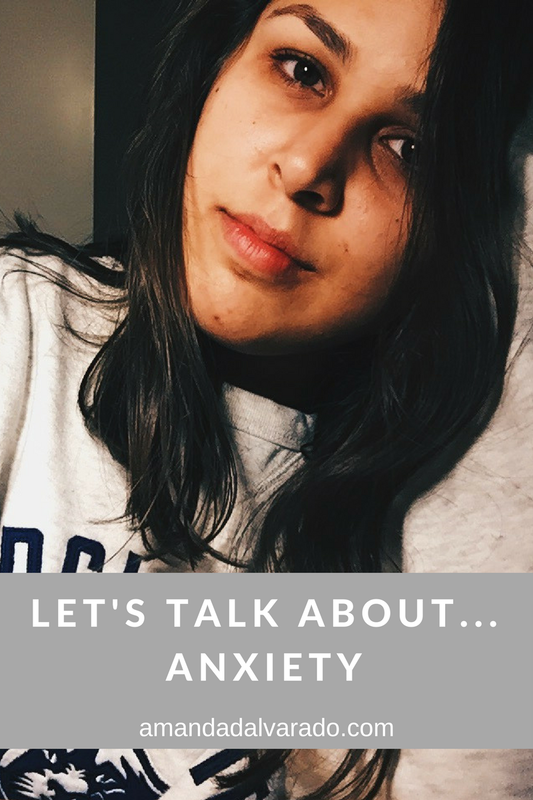 Anxiety isn't the prettiest part of my life, but it's real and it is part of my story. Tell me. What other topics shall we tackle here? What else do you want to see on the Let's Talk About... series? Nothing is off limits. I hope that the rest of your week is great. You deserve it.